This has been a weird training cycle so far for me as I’ve had to do most of my workouts minus the long runs outside. Our daughter has been sick for 2 weeks now with walking pneumonia so has had to miss most of the school days over the past two weeks. She is slowly regaining her energy but the pneumonia hasn’t quite cleared up. Today she went for a half day of school. I feel fortunate that I am a Stay at home mom because I haven’t had to stress about missing work for doctor appointments or trying to find care for her. To add to the chaos our son was also sick with a croup like illness at the end of last week. However we have been quite housebound though and could all use some fresh air and extra movement for our bodies. Everyone is feeling a bit grumpy from being so cooped up! . Hopefully we are on the tail end of this! 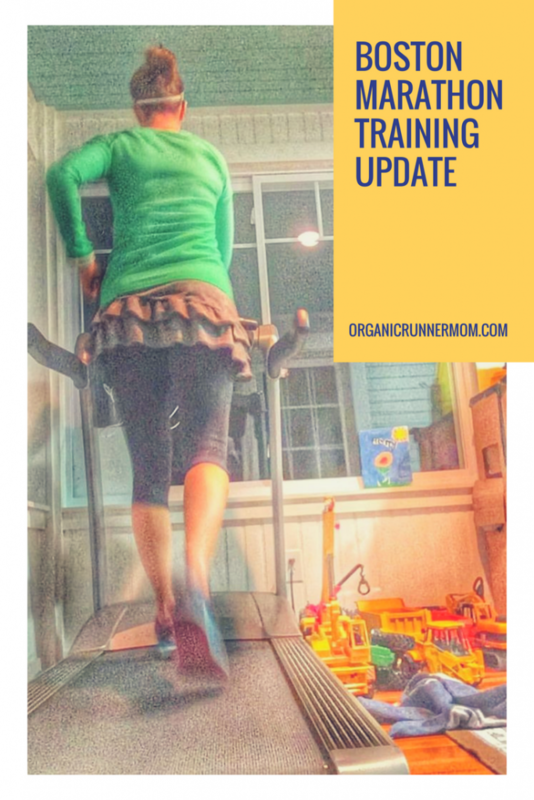 Despite the sickness I have been squeezing workouts in late at night on the treadmill or the bike trainer and managed one day of bootcamp last week on the one day when Organic Runner Girl made it to school. Thankfully I don’t mind being indoors as long as I have some good tunes to listen to, a good movie or something to binge watch. Also, once the endorphins kick in I am good to go! During this training cycle I have been swimming and biking a lot more since my focus will switch to Half Ironman (70.3 Miles of swimming biking and running) once the Boston Marathon is over. Hopefully training for triathlon through the winter will help me reach my 6:00 goal or faster in the Half Ironman this summer. Last winter when I was training for the Boston Marathon I spent most of my time running so did not feel as ready for triathlon. Hopefully I’ll be able to start getting outside more for my runs soon! This weekend I escaped my house for my long run with my friend Bridget who trained with me when I was trying to train for Boston in 2013 and has run with me through many marathon training cycles even when she is not racing at all. She is truly someone who loves to run for the love of the run. I admire her energy and passion and definitely feel more MIGHTY when I train with her! I was only supposed to run for 2 hours for my long run but since we both had some time we decided to run longer. It was a gray gloomy day made much brighter by all of our fun conversations as we ran despite the rugged hills that we ran on. We ran 16 miles on a mix of dirt roads and roads. The hills almost ate us alive! Many of you probably wonder what I usually eat on a daily basis to accompany my training. I have always really been an intuitive eater and so don’t tend to put too many limits on what I am eating. I try to listen to my body and be in tune with what my body needs but could definitely do a better job with nutrition for training and racing. 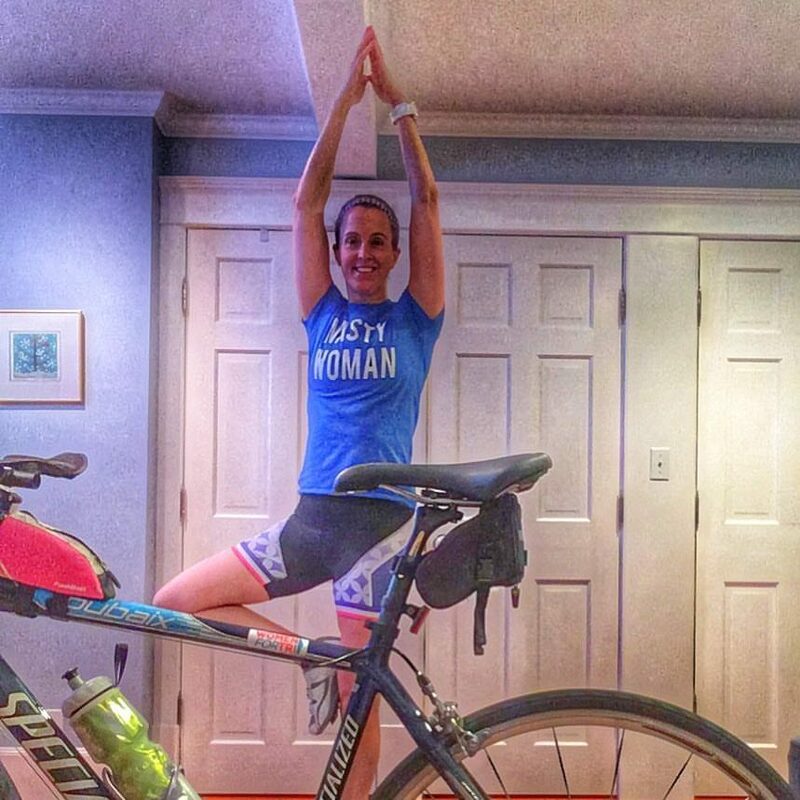 I am currently working with my coach Denise Goode, The Sustainable Athlete to help me build a more specific training plan for this marathon cycle. I have been doing well on my own but perhaps my performance could be improved a bit by working on nutrition! My coach thinks I need more calories, more fluids, and more sodium! We will be trying out some new nutrition plans soon. I will keep you updated as to what I am trying. Currently on my long runs I use GU, Skratch Labs Energy Chews, Clif Organic Energy Food, Water and Skratch Labs Hydration Mix. Tuesday 1/17-1 Hour Boot camp, 2025 YD swim, steady state-still focusing in pulling all the way through the stroke. Friday 1/20-1:00 Bike trainer, spin with pick-ups (missed a swim today, couldn’t get to the pool). Saturday 1/21-2:45, 16.1 Mile Run on super hilly roads with my friend Bridget, this was a toughie speed wise as it seemed that most of the running was up. One hill was a mile long!!! Monday 1/23-1:00 Recovery Bike, Easy spin, small ring, 90 rpm, add in a ;30 fast pedal drill every 10 mins. What was your best workout this week? What were your challenges? Poor kiddo! I hope she recovers ASAP. For everyone’s sake! I think that having the crosstraining focus will serve you well–most people are just going to be running! Oh, that’s miserable to have a kid that sick. Pneumonia… oy. Hope you all back to 100% soon. I’m sorry your baby is sick! Hope she’s on the mend soon. Good for you for doing a hilly 16 miler. All of the hard work will pay off when you hit heartbreak! Carla recently posted…One year. 75 times. I’m so sorry to hear that Piper has been so sick!!! I hope she is on the mend. Congrats on a great week of workouts in spite of all the obstacles. You’re going to have a great Boston! I hope Piper feels better soon! Poor kid! 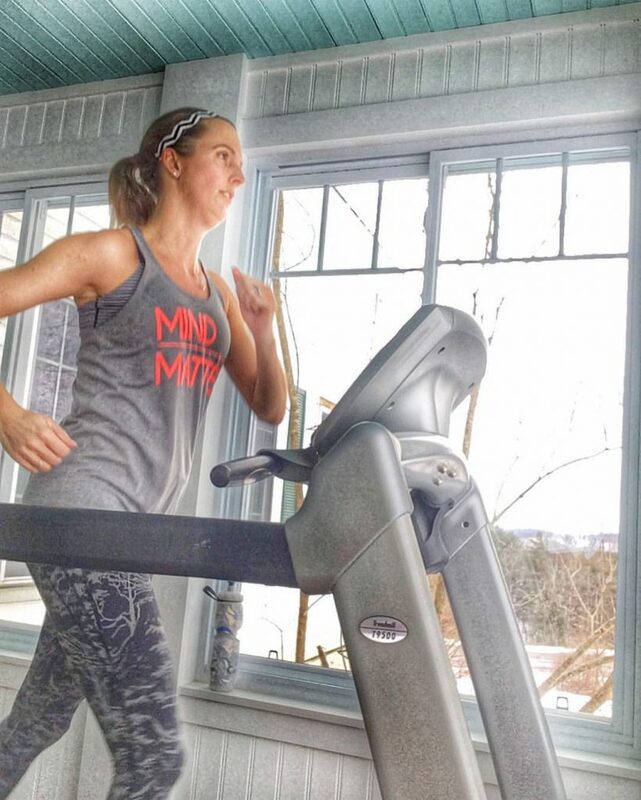 Those hills on your run look crazy but I bet they will make you so prepared for a great race at Boston!